This was a problem, according to that trainer, because our dog thought she was the boss of us. The trainer went on to forbid us to allow our dogs on the furniture, a mandate Rob and I couldn’t stick to for 24 hours. I know Corny doesn’t like that answer. Mr. Dewey doesn’t know it, but he’s failing this interview. Miserably. F, Mr. Dewey. F. You have officially earned an F on this interview. Even I can see that. “Well, I just feed her when she’s hungry. She gets a little antsy if she has to wait.” He chuckles a little, but I notice his fingers go up to his lip scar. I sort of wish I could stop him from talking now. It’s like watching a train wreck happen. Thankfully, Corny stops questioning him. “The problem,” she says, “is that Kisses thinks she’s in charge. No! It’s not instinct! Dogs do not think they are the bosses of us! Let me interject that I’ve quit more books than I’ve finished lately. Notably, The Dog Master, which I was really looking forward to, because it was written by the author of A Dog’s Purpose and is about the domestication of the first dog, something I requested someone write a book about. I just didn’t buy the relationship between man and dog in the early pages and gave up on it. Once it became clear that Fetching, a young adult book published by Disney, was using Cesar Millan as its reference text, you’d think I’d quit this one too, wouldn’t you? Not yet. I’m still intrigued by the synopsis: Olivia has just about had it with the popular kids at school… If only Olivia’s classmates were more like the adorable dogs she helps her grandmother train—poorly behaved, but improvable. Wait…what if her tormentors’ behavior actually could be modified using the same type of training that works on dogs? Olivia and her friends start innocuously enough by changing their body language to “train” their classmates, and I’m pretty sure the book won’t endorse using shock collars on people. What’s frustrating though, is that no matter how positive the rest of the training methods are, readers are going to walk away thinking dogs need their people to be Pack Leaders. The irony is that to believe dogs see us as their pack leaders actually requires that we first anthropomorphize dogs by assuming they share our human concern regarding rank and what others think of us. … the entire concept that we must assert our claim to the throne of pack leader before our dogs is based on a mirage. For the sake of argument, though, let’s say that dogs are completely motivated by a burning desire to become pack leader over their human counterparts. At some point in this theoretical exercise we must necessarily decide to disregard the simple truth – that dogs are well aware that we are not, in fact, dogs. 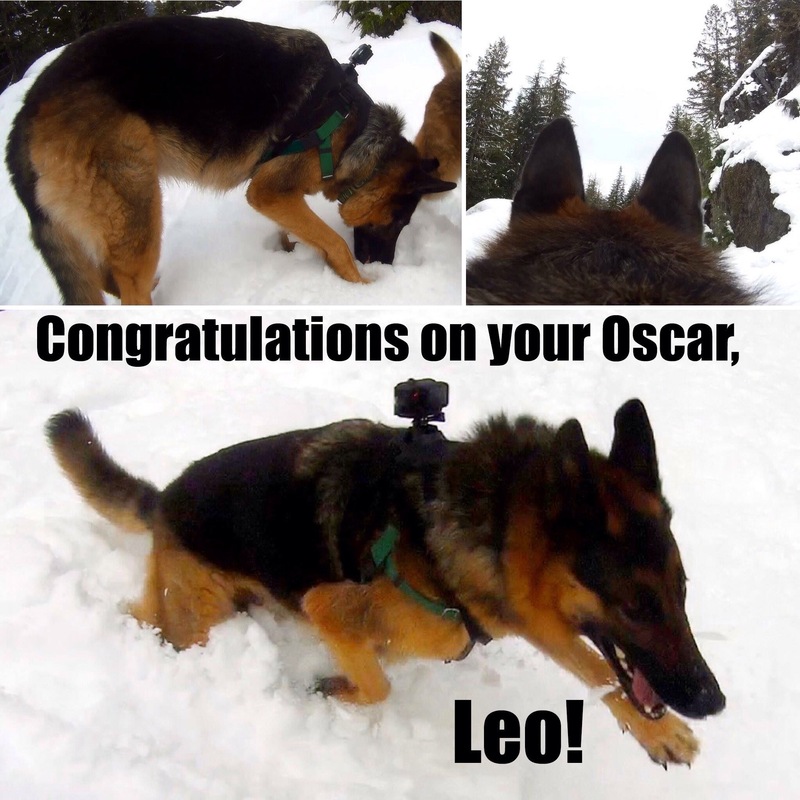 … It is time, therefore, to finally retire the term pack leader – especially when it refers to humans interacting with dogs. Domestic dogs don’t live in true packs, and even if they did, we, as a different species, wouldn’t be a part of them. This post is part of the Positive Pet Training blog hop, hosted by Cascadian Nomads, Rubicon Days & Tenacious Little Terrier. This month’s theme is National Train Your Dog Month. To learn more about my journey to understanding Positive Training, read my book Bark and Lunge, winner of three national book awards. How is this fun to watch? Since I started working on my memoir Bark and Lunge, this has become a dog blog. I love all the people I’ve met in the dog blogging community, and I plan to continue blogging about dogs. I’m working on my second book, a novel about a mixed martial arts fighter who rescues pit bulls. You may have noticed that I post a lot about pit bulls and rescue dogs. I haven’t written about MMA for a few years, but today I want to write about Ronda Rousey. I’m just going to Trojan Horse it with a picture and a video from last year of her with her dog, Mochi. Are Tamagotchis still a thing? Now then. I love Ronda Rousey. I’ve been following her for years, and gained understanding and huge respect from her memoir, My Fight / Your Fight. It is a solid memoir, thanks to Rousey’s co-writer, her sister Maria Burns Ortiz, a journalist. It tells the story of a little girl whose verbal skills were slow to develop, leaving her unable to explain to her family that all she wanted for her birthday was a Hulk Hogan wrestling doll. When she starts competing in Judo, her mother, a Judo champion herself, instills a confidence and drive to win. The thing I admire most about Rousey is how hard she works. She goes into every fight expecting to win, which is why she took her losses in Judo very hard. Turns out, the sport she was born to do hadn’t been invented yet; women’s mixed martial arts wasn’t even a thing. I was fairly devastated on Saturday when Ronda was knocked out by Holly Holm. And I feel defensive about any backlash and criticism of the sport. Still, I will answer that question. Make no mistake. It was NOT fun for me to watch Ronda get punched bloody, kicked in the neck, knocked out, and then punched three more times while unconscious. Just like it’s not fun to watch your sports team get trounced or your favorite player get carried off the field. Setting that aside (which I have trouble doing because watching the fight was emotional for me), an objective person can see the athleticism and skill behind Holm’s punching and kicking. Just imagine if, instead of getting knocked out by this this top-notch kickboxer, Rousey had shot in, taken Holm down and submitted her in a choke or an armbar. Everyone would be talking about Rousey’s Judo skills. How amazing it is that a person could defeat such a formidable opponent without doing any physical damage. That’s what I was hoping to see. And maybe we will see it in a rematch. **For anyone who compares mixed martial arts to human dog-fighting, for now, I will say only that the difference is, the dogs didn’t sign up for it. My friend Tiffany Pitts, author and mother to an awesome shepherd named Thor Michaelson, invited me to participate in a writerish blog hop. I mention Thor Michaelson because 1) this is a dog blog and 2) Tiffany and I met through Thor. Who says it’s hard to make new friends as an adult? Tiffany is the author of the hilarious and smart sci-fi novel Double Blind, which is the first in the Thanatos Rising series. I highly recommend it, especially to the cat people among you who will appreciate my favorite character, Toesy. Note: I rearranged the order of the questions for the benefit of readers who come here looking for stuff about dogs. My current project is a novel called Fight Like a Lady, about a female mixed martial arts fighter who rescues fighting dogs. I developed an affinity for pit bulls from watching Pit Bulls and Parolees, and despite not having any pit bull friends of my own, created several pit bull characters. Earlier this year, I started volunteering at the Humane Society of Skagit Valley, and discovered that everything I fantasized about rescued pit bulls is true. They’re friendly and cuddly and have huge smiles and most of them let me kiss them on the head. I know I shouldn’t go around kissing dogs I’ve just met on the head, but I can’t help it. Prior to this experience, I had written a scene at an animal shelter where all the volunteers are old ladies who are afraid of the rescued fighting dogs. I hope that when my friends at the Humane Society read it, they won’t think it’s based on them. I might need to rewrite it. I have two different writing desks at home, but right now neither is in any condition to foster creativity. The first is in the guest room, which is decorated like a little girl’s bedroom with Disney posters and other artifacts from my Hollywood days. (Note: No little girl has lived there since we bought the house.) We squeezed Rob’s old desk under the window and it is a nice writing space with a view of the rhododendrons, but it’s also hot in the summer, and right now, the room is a complete mess, with piles of clothes I mean to give away, and shoes and purses heaped on the floor. I can’t really even get to the desk, although that is where my laptop rests when she’s charging. A few years ago, I created a space for myself in our library (which at one point was the only room in the house without a TV). I pushed a balance ball chair up to a sturdy old table of my grandmother’s. But right now the table is piled up with books and papers, and not suitable for writing. Now that I have a lovely, lightweight MacBook Air, I can write anywhere. I am writing this from a recliner in the TV room. Rob and I had some trouble coming up with a name for Leo, our second dog, and I recycled some of the vetoed names in Fight Like a Lady. In my memoir, Bark and Lunge, the names mostly were predetermined, but of course, I named the main character, Isis, in real life too. I still think it’s the most beautiful name in the world, and wish it weren’t the acronym for a terrorist organization in the Middle East. Looks like I picked the wrong summer to release a book about a dog named Isis. I changed some names in the memoir, always with some connective thread that made sense to me. A dog named Belle… like Michelle, My Belle; I renamed her Rita, like Lovely Rita, Meter Maid. Shoot, now I’ve outed Belle. I’ve been steeling myself for the inevitable mean reviews, but my feelings haven’t been hurt yet. I got my first one-star review the other day, and totally agree with it. The reader said my book was “How NOT to train a dog.” Yes, as a matter of fact, that’s exactly what my book is. Sorry you didn’t enjoy it or relate to it. I would never respond to a negative review on Amazon or Goodreads, but one critical reviewer also commented right here on the blog, so I’ve had a conversation with her about some of the things she didn’t like. I understand where she’s coming from. I give away almost every book that I read. Usually to my mother, or a fellow author, or a fellow dog-lover, depending on what the book is. I’m trying to think of a book that I’ve given more than once. A Dog’s Purpose, I would give that as a gift. Or Robert Crais’ Suspect. I hereby tag Pam Helberg, a brilliant writer and friend who’s written beside me in both a fiction and memoir class, and at numerous cafes, conferences and retreats. Pam Helberg is working on her memoir, an intimate look at what happens when the Perfect Lesbian Family falls apart, a story by turns humorous and heartbreaking. Her essay “Body Language” appeared in the anthology Beyond Belief: The Secret Lives of Women in Extreme Religion Seal Press, 2013, and her essay “Don’t Hold My Hand in Pocatello,” will be published in the Ooligan Press anthology Untangling the Knot: Queer Voices on Marriage, Relationships & Identity in Winter 2015. Pam is currently working on her master’s degree in mental health counseling at Antioch University in Seattle. And then go look at some pictures of dogs and cats. Where were all the Fearful Dog support groups when I was struggling with Isis? Did they not exist, or did I not understand until way too late that fear was the root of her problem? Social media was still young then, way back in 2008. I’m part of two great Facebook communities where every day, people post questions and success stories about their fearful or reactive dogs. Truly, I am not alone. UPDATE: During the WOOF Blog Hop, I was introduced to another Facebook group for Reactive Dogs. 1) Readers will not be able to connect with the character of Isis the aggressive dog. 2) My book is not different enough from all the other dog books. I flat-out disagree with points 1 and 2, but point 3 gave me pause. It’s true! I feel sadness and regret, too! But is that any reason not to tell my story? Doesn’t the dog always die at the end? I gave the manuscript another read, searching for places where I might alleviate sadness and regret in my readers. I revised my proposal so that the chapter summaries don’t end on such a down note, and I wrote a little epilogue, describing life now with Mia. My true goal in writing this book, however, is to help others learn from our mistakes. To give hope to dog owners experiencing the same guilt and frustration that I felt while trying to train my “problem” dog. Bark and Lunge will raise awareness about the importance of socialization, the benefits of positive reinforcement, and the hazards of aversive training methods. In the coming months, I will be giving away free copies of the book to readers willing to post an honest review to Amazon (and/or GoodReads or Barnes and Noble). Stay tuned! 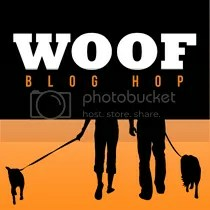 Today is the inaugural WOOF Blog Hop. WOOF = Working Out Our Fears. Not just our dogs’ fears but our own fears of inadequacy and hopelessness that our dog will never get better. Fear that other people will think our dogs are mean. Do you have a reactive or fearful dog? Please join us and share your story. The Blog Hop is open through Sunday, February 16, hosted by Oz the Terrier, Roxy The Traveling Dog and Wag ‘n Woof Pets. Last week, I had the pleasure of attending an author event like no other. Monica Drake, author of The Stud Book, was joined by her Portland writer buddies Chuck Palahniuk and Chelsea Cain for a night of flashing devil horns, glow-in-the-dark beach balls, and R-rated bedtime stories. That’s me, dead center, in red and blue. Photo: Bellingham Herald. Everyone in attendance went home with a signed copy of The Stud Book, which I read over the weekend. The Stud Book is a brilliantly written and totally engrossing exploration of breeding, mostly among a group of female friends in Portland, interspersed with fascinating details about animal husbandry. Dark and absurdist in tone, the things that happen to these characters feel like they could really happen. I love it when an author really goes there. Even scenes I found off-putting (like Georgie’s husband at the bar while she struggles at home with a newborn) paid off in the end. Generally, I’m weary of books that bounce between narratives about multiple characters. When you like some characters more than others, it’s frustrating to leave them behind for a less interesting storyline. In this book, I got wrapped up in all the characters, eager to see what would happen next. As a rule, I like novels to have more resolution to their resolution than The Stud Book does. However, I will forgive Drake for this open-endedness because the book was so thought-provoking, I don’t mind filling in the blanks with what I think will happen next. So smartly written. I look forward to reading more from Drake.